Chart by Louis Agassiz Fuertes (1920) illustrating falconers' terminology. 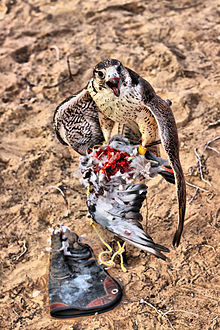 Falconry is the hunting of wild animals in their natural state and habitat by means of a trained bird of prey. 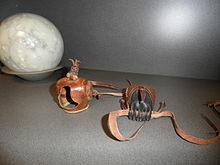 Small animals and larger animals were hunted, squirrels and rabbits often fell victim to these birds. There are two traditional terms used to describe a person involved in falconry: a falconer flies a falcon; an Austringer (German origin) flies a hawk (Accipiter and some buteos and similar) or an eagle (Aquila or similar). In modern falconry, the red-tailed hawk (Buteo jamaicensis), the Harris's hawk (Parabuteo unicinctus), and the peregrine falcon (Falco perigrinus) are some of the more commonly used birds of prey. 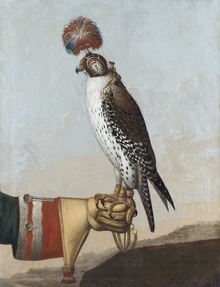 The practice of hunting with a conditioned falconry bird is also called "hawking" or "gamehawking", although the words "hawking" and "hawker" have become used so much to refer to petty traveling traders, that the terms "falconer" and "falconry" now apply to most use of trained birds of prey to catch game. Many contemporary practitioners still use these words in their original meaning, however. 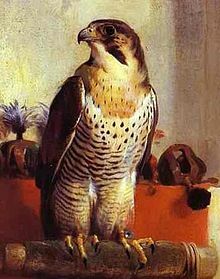 In early English falconry literature, the word "falcon" referred to a female Peregrine Falcon only, while the word "hawk" or "hawke" referred to a female hawk. A male hawk or falcon was referred to as a "tiercel" (sometimes spelled "tercel") as it was roughly one third less than the female in size. In the UK and parts of Europe, falconry probably reached its zenith in the 17th century, but soon faded, particularly in the late 18th and 19th centuries, as firearms became the tool of choice for hunting. (This likely took place throughout Europe and Asia in differing degrees.) Falconry in the UK had a resurgence in the late 19th and early 20th centuries during which time a number of falconry books were published. [page needed] This revival led to the introduction of falconry in North America in the early 20th century. Col R. Luff Meredith is recognized as the father of North American falconry. 355 AD – Nihon-shoki, a largely mythical narrative, records hawking first arriving in Japan from Baekje as of the 16th emperor Nintoku. 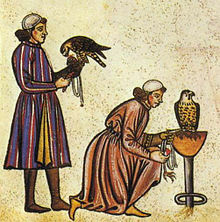 c. 1240s – The treatise of an Arab falconer, Moamyn, was translated into Latin by Master Theodore of Antioch, at the court of Frederick II, it was called De Scientia Venandi per Aves and much copied. 1801 – Joseph Strutt of England writes, "the ladies not only accompanied the gentlemen in pursuit of the diversion [falconry], but often practiced it by themselves; and even excelled the men in knowledge and exercise of the art." 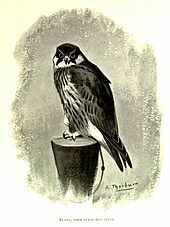 Hunting falcon as depicted by Edwin Henry Landseer in 1837. Most falconry birds used in Britain were taken from the wild, either in Britain, or taken abroad and then imported. Captive breeding was initiated. 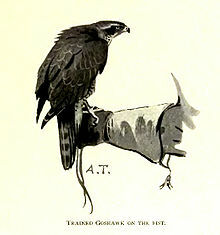 The book mentions a captive-bred goshawk and a brood of captive-bred redtails. It describes as a new and remarkable event captive breeding hybrid young in 1971 and 1972 from John Morris's female saker and Ronald Stevens's peregrine tiercel. The book does not mention telemetry. 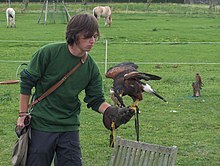 Harris hawks were known to falconers but unusual. For example, the book lists a falconry meet on four days in August 1971 at White Hill and Leafield in Dumfriesshire in Scotland; the hawks flown were 11 goshawks and one Harris hawk. The book felt it necessary to say what a Harris hawk is. The genus Falco is found worldwide and has occupied a central niche in ancient and modern falconry. Most falcon species used in falconry are specialized predators, most adapted to capturing bird prey such as the peregrine falcon and merlin. 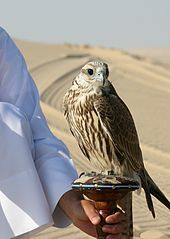 A notable exception is the use of desert falcons such the saker falcon in ancient and modern Middle Eastern and Asian falconry, where hares were and are commonly taken. In North America, the prairie falcon and the gyrfalcon can capture small mammal prey such as rabbits and hares (as well as the standard gamebirds and waterfowl) in falconry, but this is rarely practiced. Young falconers often begin practicing the art with American kestrels, the smallest of the falcons in North America; there is debate on whether this practice should continue. Small species, such as kestrels, merlins and hobbys can also be used for recreational bug hawking – that is, hunting large flying insects such as dragonflies and moths. Owls are not closely related to hawks or falcons. There is little written in classic falconry that discusses the use of owls in falconry. However, there are at least two species that have successfully been used, the Eurasian eagle owl and the great horned owl. Successful training of owls is much different from the training of hawks and falcons, as they are hearing- rather than sight-oriented. (Owls can only see black and white, and are long-sighted.) This often leads falconers to believe that they are less intelligent, as they are distracted easily by new or unnatural noises and they do not respond as readily to food cues. However, if trained successfully, owls show intelligence on the same level as that of hawks and falcons. In New Zealand, falconry was formally legalised for one species only, the Swamp/Australasian harrier (Circus approximans) in 2011. This was only possible with over 25 years of effort from both Wingspan National Bird of Prey Center and The Raptor Association of New Zealand (RANZ). 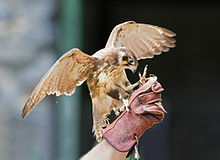 Falconry can only be practiced by people who have been issued a falconry permit by the Department of Conservation. There are currently only four practicing falconers in New Zealand. The IAF – International Association for Falconry and Conservation of Birds of Prey, founded in 1968, currently represents 130 falconry clubs and conservation organisations from 89 countries worldwide totaling over 75,000 members. The first hybrid falcons produced in captivity occurred in western Ireland when veteran falconer Ronald Stevens and John Morris put a male saker and a female peregrine into the same moulting mews for the spring and early summer, and the two mated and produced offspring. In the United States, falconry is legal in all states except Hawaii. It is also illegal in the District of Columbia. 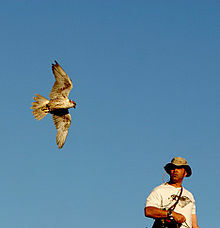 A falconer must have a state permit to practice the sport. (Requirements for a federal permit were changed in 2008 and the program discontinued effective January 1, 2014.) Acquiring a falconry license in the United States requires an aspiring falconer to pass a written test, have equipment and facilities inspected, and serve a minimum of two years as an apprentice under a licensed falconer, during which time, the falconer may only possess one raptor. There are three classes of the falconry license, which is a permit issued jointly by the falconer's state of residence and the federal government. The aforementioned Apprentice license matriculates to a General Class license, which allows the falconer to up to three raptors at one time. (Some jurisdictions may further limit this.) After a minimum of five years at General level, falconers may apply for a Master Class license, which allows them to keep up to five wild raptors for falconry and an unlimited number of captively-produced raptors. (All must be used for falconry.) Certain highly experienced master falconers may also apply to possess golden eagles for falconry. Federal regulation of falconry in North America is enforced under the statutes of the Migratory Bird Treaty Act of 1918 (MBTA), originally designed to address the rampant commercial market hunting of migratory waterbirds during the early 20th century. Birds of prey suffered extreme persecution from the early 20th century through the 1960s, where thousands of birds were shot at conspicuous migration sites and many state wildlife agencies issued bounties for carcasses. Due to widespread persecution and further impacts to raptor populations from DDT and other toxins, the act was amended in 1972 to include birds of prey. (Eagles are also protected under the Bald and Golden Eagle Protection Act of 1959.) Under the MBTA, it is illegal for people to "take" migratory birds, their eggs, feathers or nests. Take is defined in the MBTA to "include by any means or in any manner, any attempt at hunting, pursuing, wounding, killing, possessing or transporting any migratory bird, nest, egg, or part thereof". Falconers are allowed to trap, and otherwise possess certain birds of prey and their feathers with special permits issued by the Migratory Bird Office of the U.S. Fish and Wildlife Service and by state wildlife agencies (issuers of trapping permits). In 2010, UNESCO inscribed falconry as a living human heritage element of eleven countries, including United Arab Emirates, Belgium, Czech Republic, France, Republic of Korea, Mongolia, Morocco, Qatar, Saudi Arabia, Spain, and Syrian Arab Republic. Austria and Hungary were added in 2012 and Germany, Italy, Kazakhstan, Pakistan, and Portugal were added in 2016. 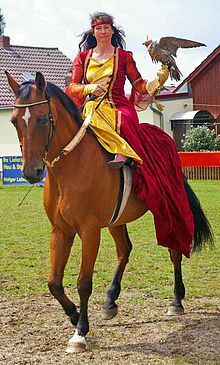 With a total of eighteen countries, falconry is the largest multi-national nomination on the Representative List of the Intangible Cultural Heritage of Humanity. The famous explorer Sir Richard Francis Burton wrote an account of falconry in India, Falconry in the Valley of the Indus, first published in 1852 and now available in modern reprints. In James Clavell's Shōgun, Toranaga, one of the main characters, practices falconry throughout the book, often during or immediately before or after important plot events. His thoughts also reveal analogy between his falconry and his use of other characters towards his ends. Gabriel García Márquez's novel Chronicle of a Death Foretold's main character, Santiago Nasar, and his father are falconers. Hodgesaargh is a falconer based in Lancre Castle in Terry Pratchett's Discworld books. He is an expert and dedicated falconer who unluckily seems to only keep birds that enjoy attacking him. In Irish poet William Butler Yeats's poem, "The Second Coming", Yeats uses the image of "The falcon cannot hear the falconer" as a metaphor for social disintegration. American poet Robert Duncan's poem "My Mother Would Be a Falconress"
^ At the moment there are about 5,000 falconers around the United states. ^ a b Bert, E (1619), An Approved Treatise on Hawks and Hawking . ^ a b c Latham, S (1633), The Falcon's Lure and Cure . ^ a b "The Asian Conference on the Social Sciences (ACSS)" (PDF). ACSS. Retrieved 29 October 2017. ^ Epic of Gilgamesh . ^ Layard, A. H. (1853), Discoveries in the Ruins of Nineveh and Babylon, London: John Murray . ^ Egerton, F (2003), "A History of the Ecological Sciences : Part 8: Fredrick II of Hohenstaufen: Amateur Avian Ecologist and Behaviorist" (PDF), Bulletin of the Ecological Society of America, Esa pubs, 84 (1): 40–44, doi:10.1890/0012-9623(2003)84[40:ahotes]2.0.co;2 . ^ Ferber, S (1979), Islam and The Medieval West . ^ Strutt, Joseph (1801). Cox, J. Charles, ed. The sports and pastimes of the people of England from the earliest period. Methuen & co. p. 24. Retrieved June 6, 2009. ^ Thesiger, W (1959), Arabian Sands, Penguin Books . ^ Mitchell, EB (1971) , The art & practice of hawking (7th ed. ), Newton, MA: Charles T. Branford . 291 pp. ^ A brief history of North American Falconry, NAFA, archived from the original on 2015-04-08 . ^ Phillott, DC (translator) (1908). The Baz-Nama-Yi Nasiri. A Persian Treatise on Falconry. London: Bernard Quaritch. ^ "International Association for Falconry and Conservation of Birds of Prey - Role of IAF". Iaf.org. Retrieved 29 October 2017. 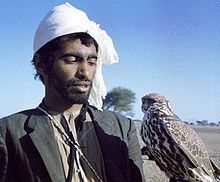 ^ a b "A Falconer with His Falcon near Al-Ain". World Digital Library. 1965. Retrieved 2013-07-07. ^ "- intangible heritage - Culture Sector - UNESCO". Unesco.org. Retrieved 29 October 2017. ^ "The Welsh Hawking Club", Austringer (36): 11 . ^ Evans, Humphrey (1973), Falconry, an illustrated introduction, John Bartholomew & Son, ISBN 0-85152-921-6 . ^ "Falconry". NZ Falconers Association. Retrieved 29 October 2017. ^ "Should Apprentice Falconers be Allowed to Fly American Kestrels?". American falconry. 1992-04-14. Retrieved 2013-03-19. ^ Hollinshead, Martin (2006), The last Wolf Hawker: The Eagle Falconry of Friedrich Remmler, The Fernhill Press, archived from the original on 2011-09-28, retrieved 2007-06-21 . ^ "International Journal of Intangible Heritage". International Journal of Intangible Heritage. Retrieved 29 October 2017. ^ a b "Eagle Hunters". Discover-bayanolgii.com. 28 December 2012. Retrieved 29 October 2017. ^ Stewart, Rowan (2002), Kyrgyzstan, Odyssey, p. 182 . ^ "The Modern Apprentice - The Red-Tail Hawk". Themodernapprentice.com. Retrieved 29 October 2017. ^ "Beginners Circle". Americanfalconry.com. Retrieved 29 October 2017. ^ "Harris' Hawk". DK: Cyber city. Archived from the original on 2013-03-05. Retrieved 2013-03-19. ^ UAEINTERACT. "UAE Interact, United Arab Emirates information, news, photographs, maps and webcams". Uaeinteract.com. Retrieved 29 October 2017. ^ "Kyrgyz berkut, kyrgyz hunting eagle". Pipex. Retrieved 2013-03-19. ^ "Wingspan National Bird of Prey Center". NZ. Retrieved 1 September 2012. ^ "Raptor Association". NZ. Retrieved 19 March 2013. ^ "North American Falconers Association". N-a-f-a.com. Retrieved 29 October 2017. ^ "International Association for Falconry and Conservation of Birds of Prey - Home". Iaf.org. Retrieved 29 October 2017. ^ "Frequently Asked Questions Regarding Peregrine Falcons". Endangered Species Program. US Fish & Wildlife Service. Retrieved 23 December 2012. ^ Cade, TJ; Burnham, W (2003), The Return of the Peregrine: a North American sage of tenacity and teamwork, The Peregrine Fund . 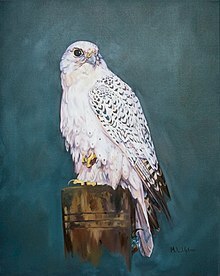 ^ Oliphant, LW (1991), "Hybridization Between a Peregrine Falcon and a Prairie Falcon in the Wild. ", The Journal of Raptor Research, 25 (2): 36–39 . ^ "73 FR 59448" (PDF). Gpo.gov. Retrieved 29 October 2017. ^ Matthiessen, P (1959), Wildlife in America, Viking . ^ "Tim Gallagher's got "Falcon Fever"" (Blog spot). Wild Bird on the Fly (World Wide Web log). Google. Retrieved 2009-04-11. ^ "Falconry, a living human heritage". UNESCO. Retrieved 10 November 2017. ^ "Sir Thomas Browne's Miscellany Tracts: Of Hawks and Falconry". Penelope.uchicago.edu. Retrieved 29 October 2017. ^ Katic, Stana (2009-10-08). Kimmel, James 'Jimmy', ed. "On Falconry". You tube (video). Retrieved 2012-05-21. ^ aapone (6 May 2005). "My Mother Would Be a Falconress". My Mother Would Be a Falconress. Archived from the original on 2013-09-21. Retrieved 29 October 2017. ^ "haggard". Online Etymology Dictionary. Retrieved 2013-12-22. ^ "lure". Online Etymology Dictionary. Retrieved 2013-03-19. ^ "rouse". Online Etymology Dictionary. Retrieved 2013-03-19. ^ "pounce". Online Etymology Dictionary. Retrieved 2013-03-19. ^ "tail". Online Etymology Dictionary. Retrieved 2013-03-19. Chenu, Jean Charles; Des Murs, Marc Athanase Parfait Œillet (1862). La fauconnerie, ancienne et moderne. Paris: Librairie L. Hachette et Cie.
Chiorino, G. E. (1906). Il Manuale del moderno Falconiere. Milan: Ulrico Hoepli. Fernandes Ferreira (b. 1546), Diogo; Cordeiro (1844-1900), Luciano (1899). Arte da caça de altaneria. Lisbon: Lisboa Escriptorio. Freeman, Gage Earle; Salvin, Francis Henry (1859). Falconry : Its Claims, History and Practice. London: Longman, Green, Longman and Roberts. Freeman, Gage Earle (1869). Practical falconry - to which is added, How I became a falconer. London: Horace Cox. Fuertes, Louis Agassiz; Wetmore, Alexander (1920). "Falconry, the sport of kings". National Geographic Magazine. 38 (6). Harting, James Edmund (1891). Bibliotheca Accipitraria: A Catalogue of Books Ancient and Modern Relating to Falconry, with notes, glossary and vocabulary. London: Bernard Quaritch. López de Ayala (1332-1407), Pedro; de la Cueva, duque de Albuquerque (d. 1492), Beltrán; de Gayangos (1809-1897), Pascual; Lafuente y Alcántara, Emilio (1869). El libro de las aves de caça. Madrid: M. Galiano. Phillott, Douglas Craven; al-Dawlah Timur Mirza, Husam (1908). 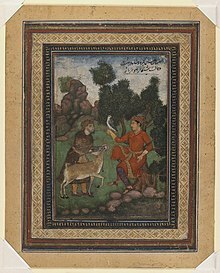 The Baz-nama-yi Nasiri, a Persian treatise on falconry. London: Bernard Quaritch. Riesenthal, Oskar von (1876). 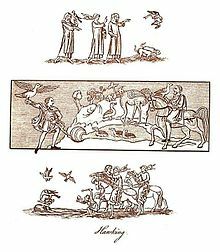 Die Raubvögel Deutschlands und des angrenzenden Mitteleuropas; Darstellung und Beschreibung der in Deutschland und den benachbarten Ländern von Mitteleuropa vorkommenden Raubvögel. Cassel, Germany: Verlag von Theodor Fischer. Deva, Raja of Kumaon, Rudra; Shastri (tr. ), Hara Prasad (1910). Syanika satra: or a book on hawking. Calcutta: Asiatic Society. Look up falconry in Wiktionary, the free dictionary.